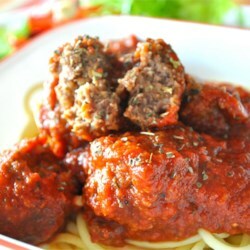 Excellent meatball recipe. This is good in homemade BBQ sauce or a good marinara and also in meatball sandwiches. Dosen't matter how you use it, it always turns out fantastic. This also works well with ground turkey or chicken and even adding a little italian sausage is good, too. I do like to use my own homemade italian seasoning and homemade seasoned bread crumbs (brush day old bread with garlic butter, bake until crispy, then run through the food processor until finely ground) in this recipe I also do what LTH does and double it because either my boys eat them all up or I'll make one batch and freeze the other. If you have any leftovers, it's even better the next day. GOOD STUFF.